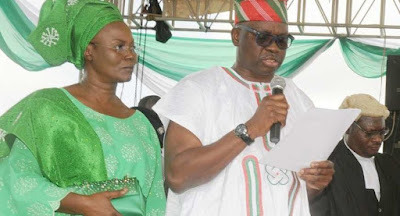 An interest group, Ekiti Development Organisation (EDO), has criticised the governor’s wife, Mrs. Feyisetan Fayose, for her outburst against opponents of her husband’s “continuity agenda”. Last week, Mrs. Fayose said those opposed to her husband’s continuity agenda would face the wrath of God. She claimed that “it was God who instructed Fayose to choose his deputy as successor”. Fayose adopted his deputy, Prof. Kolapo Olusola, as “the sole Peoples Democratic Party (PDP) candidate”, a move described as “imposition” by some aspirants, leaders and members. But in a statement yesterday by its Coordinator, Gbenga Babawibe, EDO said it considered Mrs. Fayose’s statement as “her bloated personal opinion”. It expressed doubts about Mrs. Fayose’s claim as a prophetess, after the failure of her prediction that former President Goodluck Jonathan would be re-elected at the 2015 general election”.